A community puts everyone on an equal playing field. It has the group looking out for those with the least resources. It cares beyond dollars and cents. It is a long term commitment beyond a marketing campaign. Too many companies have organized themselves into “communities,” only to abandon those communities at the exact moment there is economic question about a slowing growth rate in that specific market. Their commitment to the community lasted as long as they could profit from it. Likewise, it is hard to truly “build” a community. Communities exist already. A list of Twitter followers is not necessarily a community. For businesses, feeling as though you have built a community simply because you have a significant financial stake in one creates an imbalance, and a rift in perception. Because you bought it doesn’t mean you own it. You don’t sell to a community. You support a community. You provide for a community. You connect a community. You mediate a community. You balance a community. You sacrifice for a community. Sure, there are times when you are a member of a community, and times at which you may offer a product to that same group of people. But oftentimes, that does not mean you are supporting the community in doing so, it simply means that for the moment, the community is being used as a market. So when brands talk about building trust, it can never just be one step in the process to a sale. I’m not saying there is anything wrong with selling a needed and desired product to a group of like-minded people. But I am saying that there is a difference between building a community and selling to a marketplace. As the business landscape rushes into social media – a more nuanced connection with people’s lives – this is something to be understood. The business funnel of marketing to a segmented group of people is not the same as building trust within a community – of supporting a community. 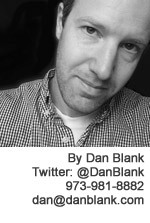 Let me know if I can help you in serving your community: @DanBlank, 973-981-8882 or dan@danblank.com. Previous post: What Motivates Us to Innovate?